Chelsea have confirmed the temporary departure of midfielder Lucas Piazon to Chievo for the remainder of the ongoing campaign. The Brazilian has barely featured for the Blues since signing for them seven years ago with most of his time spent in temporary deals away from the club. As such, Piazon has been widely fancied to part ways with the Blues of late and the club have now announced that the midfielder has linked up with Chievo for the rest of the season. 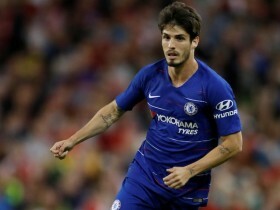 Piazon, who has made just one substitute appearance for the Blues this term could thereafter leave on a free transfer, given his contract expires at the end of the season. Meanwhile, Chelsea will be aiming to return to winning ways this weekend where they are scheduled to face a struggling Huddersfield Town at Stamford Bridge. The Terriers bagged a point at the Bridge last term which took them to relegation survival but they may not replicate the result amid the dreaded run of form.